The face of the sun has been blank (no sunspots) for 13 consecutive days. The last time this happened was April of 2010, near the end of a deep Solar Minimum. The current stretch of blank suns heralds a new Solar Minimum expected to arrive in 2019-2020. Is space weather coming to an end? 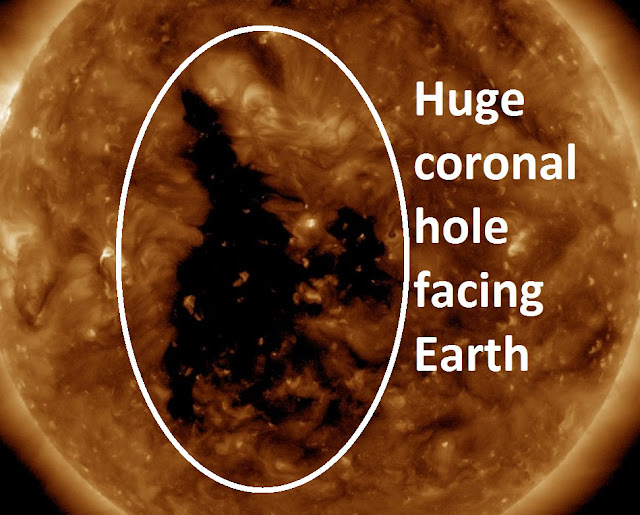 The large coronal hole in the sun's atmosphere and has swung into geoeffective position. Solar wind flowing from the hole is expected to strike our planet's magnetic field and spark G1- to G2-class geomagnetic storms later on in the week.